In this series of articles, I would like to take a look at the more expensive, most sought after sets of all time. Instead of reviewing the sets I thought I would address the parts of the sets that make them so rare and valuable. New collectors may wonder why they can't just build these popular and expensive sets out of the LEGO pieces scattered throughout their house. Inexperienced buyers may have concerns over what parts might be replaced in used sets that they are buying. People looking into bulk lots might want to know what clues in a lot would indicate that one of these popular sets are present. The first set on my list is 10212 the UCS Imperial Shuttle. I know that the Millennium Falcon 10179 is much more popular, but I want to do it justice, so need more time to work on it. The Imperial Shuttle, 10212, was released in 2010. The original retail price of this set was $259.99. Used complete sets sell from $400-$500 while New in box sets sell for $550-$650. The box shows a total of 2503 pieces including 5 minifigures. New collectors would probably balk at the price tag for this set. It's hard to fathom why a bunch of little plastic bricks that seem so ubiquitous could ever be worth that much. Sadly, that's not really close to top of the mark for sets, and these collectors shouldn't wait too long to have that band aid ripped away. The first reason that this set is not one that you could just assemble from all of your kid's loose bricks is because it is 2503 pieces. I guarantee that your kid would notice that many missing pieces. These pieces are not just random, they were selected, designed, and tested to go together to make the best representation of this iconic ship. Some of these LEGO pieces are very common, but you still may not have enough of them to fill in this set. As you can see, the volume of some of these elements can be intimidating. Even though most of these elements are common and cheap, most vendors on Bricklink do not carry the inventory to cover your needs for these pieces. You'd have to make multiple purchases, pushing the average cost of these pieces up, due to all of the shipping and handling charges. Of course your savvy Briclinker will know to either have multiple wanted lists running, to spread out their costs, but still a lot of pieces means a lot of separate orders. Apart from the Large number of common pieces, you also have some specialty pieces that make up a set. The specialty pieces are ones that are either unique to the set or in so few sets as to make no difference. The unique and specialty pieces in the sets tend to have values that reflect a large proportion of the total value. This causes some collectors to forego the piece in favor of a cheaper alternative, whether it is the same piece in a different color or completely different pieces that serve a similar function. Unethical resellers will replace these pieces and not tell the end users who may not know to look. In some cases, people have made fakes. Spotting fakes is important, but not the focus of this article. The stickers for this set sell in the $40-$50 range. Bought separately attached to their elements The large sticker should run about $20-$30 and the individual computer screens $10-$15 each. The Large Sticker is attached to Element 90498 Black Tile 8X16 with Bottom Tubes which is only available in 12 sets. Most of those sets are UCS sets. It's a relatively cheap part at around $2, mostly because it is in the Rhino and Sandman Supervillain Teamup, a relatively inexpensive set that many are parting out. One of the harder to find elements is 32 White Technic Lift Arm 1X7 Bent Element 32348. It's available in 8 other sets and averages $.50-$.60 each. It's currently available in the Ferris Wheel 10247. You also need 8 Light Bluish Gray 40 Tooth Technic Gear Element 3649 which average about $1 each. There's a light Gray version which lazy builders might include, even though it is incorrect, because they don't want to take the time to verify it is correct. The windscreen 6267 is only available in Translucent Black in 3 sets. One of those sets is currently available and less than retail LEGO City Train Station 60050. Before that set was released, this element was more than likely fairly expensive, since the other set it was available in was the Grand Emporium. There are 4 Trans Clear Technic Gearbox 2x4x3 1/3 that usually costs about $1-$2 each 6588 It's not a terribly uncommon piece (available in 20+ sets) but only the Imperial Shuttle has this many. A cheap piece that is only available in 4 sets is the White Windscreen 7x4x2 Round Extended Front Edge 89762. The only reason that I can conceive that this piece is inexpensive is that it was available in a very cheap, common set, Freeco Speeder 8085. Element 3046a is also a cheap rare element. It is available in 3 sets. It's a light bluish gray 2x2 double concave slope. It's available in the SpongeBob Squarepants Flying Dutchman 3817 and Sith Fury Class Interceptor 9500. Both of which were clearance in the past couple years. My final rare element is the White slope 2x2x3 Double Convex Element 3685 It sells for about $3-$4 and you need 10 of them. 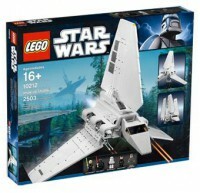 It's available in 4 sets including the Imperial Shuttle Tydirium 75094. The last thing that many collectors consider when purchasing this set and the most obvious thing that you could see in a bulk lot are the 4 instruction books. These books, as a set, sell for between $40-$75 and are available in the $100 range. If you've got a box, that gets you closer to the upper range of $500 than if it is missing. The hard parts of putting this set together are the rare elements and the sheer number of pieces. The average LEGO collector could probably get 25-33% of the way to completing this set. The rest would take a lot of time and money to buy in multiple lots. People who have used Bricklink to build sets like this typically look back and determine that they have spent more than the average sale price to accumulate the pieces of this set. Value is a tricky thing. It's hard to explain to someone who is not involved in the hobby, because they just see a lot of plastic bricks. Collectors see the rarity of an old piece that is well constructed and was not common while it was in production and has become less so since then. New collectors come into the hobby every single day, and some that have been collecting for a while have begun stretching out to the more expensive sets. The UCS Imperial Shuttle is in the middle of the pack as far as cost goes in the world of UCS sets. Quick quiz: I lifted some pictures from an auction that closed a couple months ago. Could you pick out this set from the photos? Would you know that this was a UCS Imperial Shuttle? What if I gave you this picture? Quick note from jaisonline. As mentioned in the article, the 10212 Imperial Shuttle has been selling for $400-$500 (used) and $550-$650 (new in box). So how much would the bricks, manuals and sticker cost if we "bricklinked" our own 10212? Using current used prices on bricklink.com, it would cost $539 (before postage) to purchase everything except the box in used condition. "2,488 Items in 226 Unique Lots totaling US $538.90 ready to be uploaded into your inventory." Postage can easily add an addition $100. Thus, 10212 is an example where it makes sense to buy the set (new or complete) in one transaction. Great article and for me expertly timed. Over the last 2 weeks I've been looking at this set even more seriously (one i dont have & near the top of my list) and the option to bricklink one. In Europe, which can sometimes can be a different market to US; but 100% agree with your conclusions here. Just on the stickers. I've seen a number of replica ones available on eBay. Have no idea how the quality compares but is this one avenue that you'd consider going down? Or is the quality of these cheap just not worth it? Is that BL value with "used" or with "new" components, or a mix? Great write up, thanks! I've actually been slowly trying to bricklink this set for the past few months, and I'd certainly agree with you that it's not an easy one to get all the parts for. The sheer number of some of the parts required means lots of shipping costs from multiple sellers, or paying OTT prices from some of the big BL sellers. I've just been slowly collecting parts when making other order for other things, but already I can see that buying a used one might have been a smarter option. I would imagine that there's a difference in print quality. The paper may not be terribly far off, probably a little more matte. I would imagine that the major difference is the sharpness. The big problem that you run into is, if you ever sell it, using fake stickers, it's not to be considered complete. Fake stickers should be considered an alteration. If it were just for me, never to escape from the black hole that is my personal space, sure I might consider it. Spending $10-15 on a 2x2 tile that had a sticker on it for the AT-ST that I had to finish up last year hurt me, but was necessary to make it ready to resell. Print and paper quality. Please the following thread for more details using 10179's sticker sheet as an example. Maybe that's a different type of article, when and how it makes sense to bricklink a set from scratch. (sorry, tangent, just gave me something to think about.) I would consider the method of tacking pieces onto other purchases one of the ways that it starts to make sense. You're not directly affecting your total expenditures by absorbing the whole S&H into the cost of your set. Plus, maybe it makes more sense to your personal budget to spend 10-25 a week on the parts than $500 at a whack. Thanks for taking the time to write this informative and fun article. Definitely worth more than 3 likes I'd say. Looking forward to the next. the other option of course is to tell Lego you got the set with 2500 pieces missing. LOL, I would love to hear that conversation. OK, here's a clue to the next article in the series Can you tell which Iconic ship is here? Great write up, enjoyed it. I have a crisp one stashed somewhere. I'd like to find it and build it! hi. question for you all about the 10212. did this set ever come shrink-wrapped from Lego? i bought one a while ago ago (off eBay) and it came shrink-wrapped in a pretty professional way. the tape seals under the shrink-wrap are still sealed and i can hear the contents inside. can anyone confirm? perhaps a canadian version? i just did not know if lego ever shrink-wrapped this or any other set in the past. thanks! It was surely skrink wrapped by someone other than Lego. ok, thanks. my thought too, but wanted to ask. Awesome, awesome write up. Definitely looking forward to this series of blogs. Found at a local FB Lego Sales Group, 5 minifisgs, box and instructions included..... $180 ! !